← Say Cheese…..Its National Cheesecake Day! Recent consumer research conducted by Midan Marketing regarding types of meat available at supermarkets revealed some interesting responses and a few knowledge gaps. 72 % of shoppers surveyed who said they would like to buy “antibiotic- and hormone-free” meat. 44 % of shoppers surveyed who made no changes to their buying behavior after learning about “antibiotics and growth hormones” used in livestock. 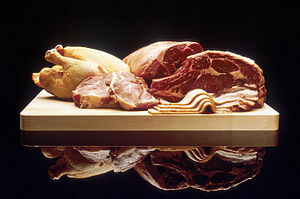 42 % of shoppers surveyed who said they were concerned about the effects of “growth hormones” in meat. 41 % of shoppers surveyed who said they were concerned about the negative effects of antibiotics in meat. 20 % of shoppers surveyed who said they switched to a natural or organic brand of pork or beef after learning about “antibiotics or growth hormones” used in livestock. This entry was posted in Focus on Agriculture and tagged Antibacterial, Beef, Consumer Reports, Fill Your Plate, food, Health, Hormone, Meat, Shopping, supermarkets. Bookmark the permalink.